Sierra Energy says it can convert idled steel mill blast furnaces into trash-to-biogas reactors, saving on the cost of building a plant. Sierra Energy wants to turn laid-off steel mill workers into trash-to-clean energy workers. The Davis, Calif.-based company says its FASTOX technology can convert steel mill blast furnaces into syngas factories. It works using steam-enshrouded oxygen, instead of regular air, to improve the efficiency and gas output from working blast furnaces. That gas can be recycled to save energy throughout the rest of the plant, CEO Michael Hart – also head of parent company Sierra Railroad – said Tuesday at the AlwaysOn GoingGreen conference in Sausalito. It's a bit like the red-hot iron gasification technology that Ze-gen is developing (see The Iron Man of Greentech Gets $20M), but with a twist – Sierra wants to use furnaces that are already built. Only a few dozen of those massive furnaces are now left in the United States, Hart said. But those could be repurposed to take in trash and pump out syngas, perhaps offering a shot at revival for communities hard-bit by the domestic steel industry's woes. Sierra is looking at a U.S. Steel mill in the iconic Rust Belt city of Gary, Ind. to test out its system, he said. But in China, where most of the world's steel is now made, there are about 1,500 blast furnaces that could use the extra gas, he said. Sierra is talking with heavyweights Baosteel and Jian Steel in that country, Hart said. In either case, Sierra avoids the need to build a plant from scratch, which saves a lot of money, he said. There are numerous ways to make substitutes for natural gas from waste. Environmental Power produces methane and syngas from manure, and Nexterra Energy converts wood chips into syngas for companies in Canada and the United States (see Funding Roundup: Mega Solar Deals, Algal Biofuels and Clean Water). But trash is an attractive fuel source, since you get paid to take it through your doors – up to $30 a ton for some big city landfills and there's about 400 billion tons a year of it to get rid of somehow (see Greentech Innovations: Why Trash-to-Fuel Might Finally Work). But landfill waste can also be a mess of biomass, metal, plastic and chemicals that can add costs and complications to its efficient conversion to a gas clean enough to burn. Government incentives may align on Sierra's behalf, however, if its technology is proven in the field. The Department of Energy sees a $256 billion market in making factories more energy self-sufficient through capturing otherwise wasted energy, and has announced some $156 million in stimulus grants to speed up the conversions (see Green Light posts here and here). 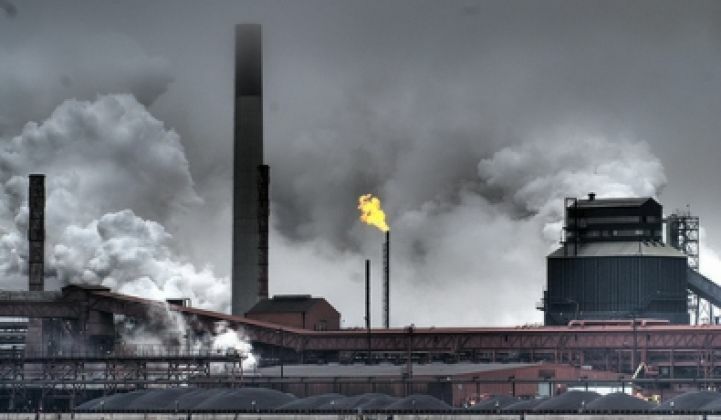 And of course, reviving steel mills may be attractive to some of the states – say, Pennsylvania – that have been receiving their shares of clean energy stimulus grants.